Dr. Haresh Sampathkumar is the co-founder of JH Rehabilitation. He completed his medical training at Sri Ramachandra Medical College and Research Institute, Chennai in 2011. He completed a one-year Internal Medicine Internship in 2014 at Unity Health System, Rochester, NY and three years of Physical Medicine and Rehabilitation training in 2017 at New York Medical College/Metropolitan Hospital Center, New York. He then completed a one-year fellowship in Brain Injury Medicine in 2018 at The University of Texas Health Science Center at Houston/TIRR Memorial Hermann, Houston, Texas (ranked #2 best rehabilitation hospital in the U.S.). Although his primary interest is in treating Brain Injury patients (stroke, traumatic brain injury, brain tumor, anoxic brain injury etc), as a Physical Medicine and Rehabilitation specialist (also known as a Physiatrist), he can treat a wide range of orthopedic, neurological, cancer, amputation, burns, cardiac, pulmonary, geriatric, and pediatric conditions and reduce pain and disability to help them lead an independent life. Depending on the condition, treatment can be through various combinations of medications, injections, assistive devices, physical modalities, physical and cognitive exercises. Aside from clinical activities he has a keen interest in research and academic activities. He was recognized twice (2016, 2017) for his Excellence in research and scholarly pursuits during his three-year residency at New York Medical College. 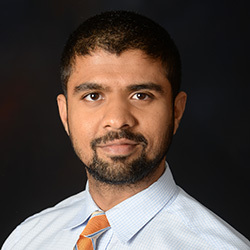 He has written book chapters, has been an abstract reviewer for American Academy of Physical Medicine and Rehabilitation (AAPM&R) annual conference 2018, published in peer-reviewed journal, NeuroRehabilitation and contributed to dozens of scientific abstracts presented at various international conferences such as Association of Academic Physiatrists (AAP), North American Brain Injury Society (NABIS) and AAPM&R.